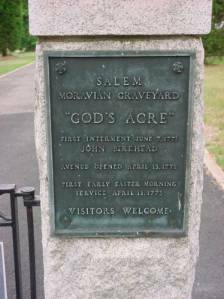 On June 7, 1771, the first burial in God’s Acre, the cemetery of the Salem Moravian Congregation, took place when the body of John Birkhead was laid to rest. God’s Acre is the common name for Moravian cemeteries, most of which are divided into large squares separated by pathways. The identical stones in the churchyard are all white marble and recumbent. Their uniformity, except for the names, is symbolic of the Moravian belief in the equality of all in the eyes of God. Men and women are buried on opposite sides of the main path in accordance with the 18th century choir system, as the Brethren and Sisters sat at worship. Salem Congregation’s God’s Acre, in Winston-Salem, is the largest in North Carolina. It contains more than 6,000 graves. It is used by the 13 Moravian churches that form the Congregation. Birkhead’s grave is in the second square on the right through the central arch of the cemetery. Amid the hustle and bustle of a busy city, God’s Acre provides a calming place in which to admire the quiet beauty and serenity of the humble surroundings. For more about North Carolina’s history, arts and culture, visit Cultural Resources online. To receive these updates automatically each day, make sure you subscribe by email using the box on the right, and follow us on Facebook, Twitter and Pinterest.